Portable Executable (PE) is a file format used in Windows executable files. This file format is a specification for an executable file. Other popular executable file formats are ELF used in in Linux and Mach-o in OSX. The PE file format is a data structure that contains the information necessary for the Windows OS loader to manage the wrapped executable code. Before PE there was a format called COFF used in Windows NT systems. It’s a complicated structure so, I commented out stuff relevant for this discussion. After the DOS header there is a stub program that as discussed above. e_magic is ASCII set to “MZ” which stands for Mark Zibikowski who developed MS-DOS. We care only about e_lfanew which is a pointer to PE header. Let’s take a brief look at NT Header. We have Signature which contains some well known value to identify the structure. FileHeader and Optional Header is embedded in structure and are not a pointer. Machine refers to type of architecture (x86-64 or x86). TimeDateStamp is the unix timestamp when the file was linked. Now what can we do from above information to hide our malware? Answer is to erase the header from memory and recovery of executable will become almost impossible. Let’s try it out. I will be using rekall tools, you can grab it from here. First step is to compile and run the above program. Then run winpmem (download from rekall link) and run this command as administrator from cmd prompt. 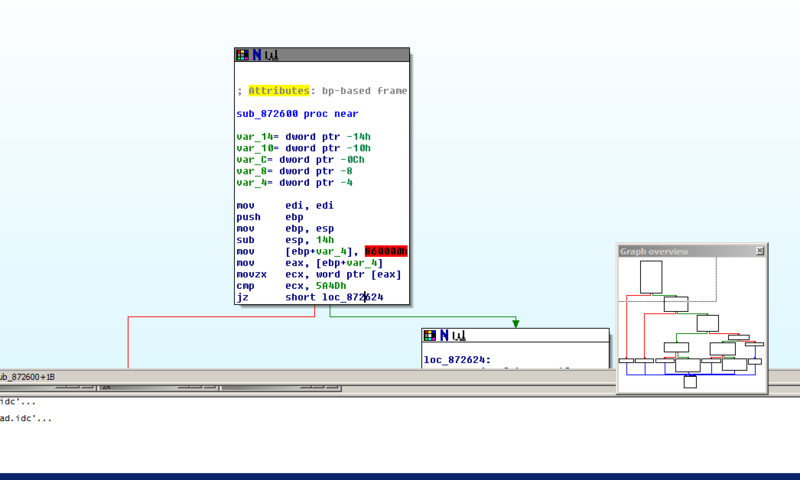 Opening it in IDA, looks like regular binary, with everything intact , it even works on double clicking it. Now Let’s try by erasing the header and see what happens. And BAM!! IDA Can’t read anything from it. Neither can any other debugger since we corrupted header which contains all the meta data about a program. All the credit goes to int0x80 for showing this technique.